Dimensions in Travel is experienced and eager to meet the needs of those who are experiencing vision loss. . We have been the travel agency for Guide Dogs for the Blind since 1991. We do not have a group guide dog cruise planned at this time, but please email Andi if you'd like to be added to our cruise notification list. We love to plan vacation travel for individual blind travelers. Aloha! Our Hawaii cruise sailed roundtrip from Los Angeles December 5-19, 2012 aboard the Golden Princess. GUIDE DOGS INSPECT THE SEA PRINCESS IN SAN FRANCISCO 2011 We hosted 20 guide dogs and eight puppies in training from Guide Dogs for the Blind (and their owners & families) for a day aboard Sea Princess in San Francisco. We wanted people with vision loss to experience first hand how accessible cruising has become and Princess Cruises has been so welcoming of our guide dog teams. A video crew documented the day and it's been posted to Youtube. Check it out: http://youtu.be/tHm3CpXc1wg. We've sailed many times to Alaska with our guide dog groups. One family surprised their guide dog-using dad by joining him on the cruise reunion! Along with four relaxing days at sea, we visited Sitka, Juneau, Skagway, and Victoria. We heard the splash of breaching whales, noisy steam trains, noisy calving glaciers and the crunch of floating mini-icebergs that gently nudge our ship. One of our group members won the talent show for her rendition of "Endless Love". 2009, 2008, 2007, 2006 and 2005 GUIDE DOG CRUISES TO MEXICO - OLE! Guide dog teams, cane users, and wonderful family and friends have joined us on 10 or 11-day Princess or NCL cruises to Mexico roundtrip from San Francisco. We have visited Puerto Vallarta, Acapulco, Mazatlan, and Cabo San Lucas, La Paz and Topolobampo along with relaxing days at sea. Our Mexico cruise memories are an amazing jumble of dog kisses, snorkeling and kayaking for the first time, swimming with dolphins (dogs watch poolside), handicraft marketplaces, tequila tastings, bicycle cab rides and the swinging bridge of Puerto Vallarta..
We had a great time sailing roundtrip from New York. Ports of call were Halifax, St. John, Bar Harbor, Boston, and Newport. Our group members loved the excitement of New York City, riding the rapids on the Bay of Fundy, walking the Boston Freedom Trail, exploring lighthouses, playing bingo,and eating lobster. We even arranged a private tour tour at the Metropolitan Museum of Art. LOVE AT SEA FOR GUIDE DOG TEAMS! We're delighted that two guide dog users Kelly and Shannon, who met on our Disneyland 2003 trip became engaged on our 2008 guide dog cruise to Mexico! 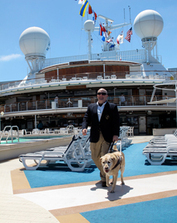 Two guide dog users who first cruised with us on our Alaska 2004 cruise tied the knot on a Princess Mediterranean cruise in July 2005. Deborah and Dennis were married at sea by the Captain of the Grand Princess as they sailed through the Greek Isles. Congratulations to all! Guide dog users, cane users, their families, friends and 21 guide dogs had a fabulous time on a 10-night cruise to Alaska in 2004. World Trade Center Survivor Michael Hingson, who is blind, delivered four fascinating lectures through the Princess ScholarShip@Sea program. Michael's presentations provided in depth insight to 1500+ passengers on what it is like to be blind in a sighted world and the powerful relationship between guide dog users and their dogs. We offered a Juno demonstration for sighted people simulating a blind person walking with their dog.